Freemasonry. Making Good Men Better. If you're interested in joining Freemasonry, we would be more than happy to answer any questions you may have about our fraternity, what the requirements are, how to join and what to expect. Get to know more about our lodge, our events and what we've done. We're one of the most active lodges in the Endicott area thanks to the generous contributions of time & the talents of our members. Our Lodge Building is a 155 year old historic landmark, located in the Town of Union on the East Main Street Corridor. The hall is available to be rented any day of the week for parties and events. "On behalf of Round Hill Lodge, I'd like to personally welcome you to our website. Consecrated in June of 1863, our Lodge has a large & vibrant membership that’s active in the local community, providing many involvement opportunities for members and visitors alike. Our Masonic tenants of Brotherly Love, Relief and Truth guide us in our efforts to be better men and we invite you to get to know us. Round Hill Lodge meets on the 2nd and 4th Monday of every month at 7:30PM. If you’re a visiting Brother please contact the Lodge in advance so that we may make all the necessary arrangements.......I hope you’ll stop in, meet our members & take part in our Masonic fellowship." ~W∴ M. Carl Northrup, Round Hill Lodge #533. Summer is gone and fall is now upon us.......the activity levels have been increasing quickly! The new lock has been installed at the main door of the lodge. If you do not have access and believe you should, please contact me at cnorthrup@juno.com and I will assist you. 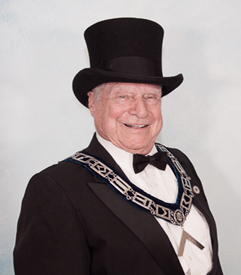 The Third degree which was scheduled for Monday - October 09th, 2018 will now be done in cooperation with Binghamton Lodge 177 at 22 Lewis Street in Johnson City on Wednesday - October 24th, 2018. I am meeting with W∴M∴ Benjamin C. Paley to set up the final plans. Please refer to our Lodge Calendar for any and all changes. to be informative and very constructive. There is a BIG change in the way we present the 3rd degree so please attend if able. Please take note of the Trestleboard as there are some significant changes happening and the Masonic Child Safety ID is taking place on October 30th & October 31st, 2018 in Endwell & Johnson City respectively. Please help if you can by contacting me directly. Finally, I will be away from October 09th, 2018 until October 18th, 2018. Please direct all questions and concerns to the Senior Warden at gceny1@gmail.com if you need anything and it can't wait until I return. ©2018 Round Hill Lodge F. & A. M. This Site Designed & Powered by DBC WebSolutions. All Rights Reserved.